Fortunately for users of Windows 7, grabbing themes from the Internet which dramatically change the style of your Windows desktop and overall look and feel of the operating system is rather easy. Unfortunately, it isn't always the easiest task to get the theme running correctly because certain built-in Windows settings make it difficult for third parties to display Windows differently. Thankfully, UxStyle makes it easy to install desktop themes on Windows. To install a theme after installation of UxTheme, you just have to copy the Windows theme (. Version 0.2.2.0 is a freeware program which does not have restrictions and it's free so it doesn't cost anything. 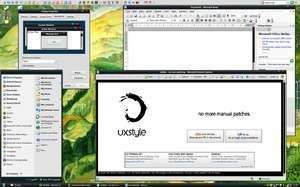 For security reasons, you should also check out the UxStyle download at LO4D.com which includes virus and malware tests. Additional screenshots of this application download may be available, too. UxStyle has a presence on social networks.